Can you remember back to the moment that music changed your life? I mean, really made you sit up and take notice? Took you on a journey (there's my travel reference! ), made you sit up and take notice of the music around you? Well the following album did it more me, simple pleasures but oh so wonderful. Thirty years ago Marillion bought an album out that to this day remains in my all time top three and was the moment I thought "hell this sounds amazing". This was the point where I fell in love with music, sometime in June 1985. Heres' my journey. I biked 4 odd miles up and down country lanes to the nearest record shop to buy it on tape (I know showing my age!) I brought it from a little independent shop called Record House (I'd end up working there) in nearby Amersham (Bucks, UK). With tape in hand I peddled as fast as my little legs could take me home to my awaiting walkman. As soon as I put it into said walkman and heard the first haunting sounds of the opening track it was like being hit in the face! What was coming into my ears was like nothing I had ever heard before. It was amazing. A new alien world being discovered. From then on in it was pure heaven, beautiful guitar sounds from the mighty Steve Rothery and lyrics of pure poetry from Fish across the 10 tracks, split into two sides (without a break). We're talking prog rock here! There is a moment in the second half when the song (Bitter Suite) breaks into a wonderful guitar solo, that too this day still sends a little shiver down my spine (why does music do that?) There are many other moments when all the band sound so cathartic, so together. 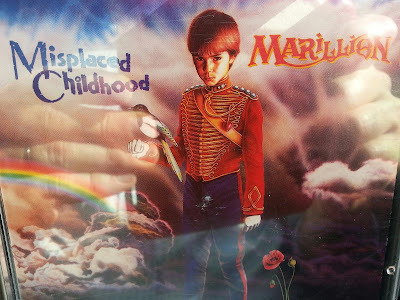 I still love the band to this day but Misplaced Childhood is the only record I've ever played back to back. I had too, to me it was that good.